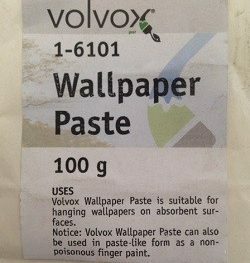 Earthborn water soluble Wallpaper Paste is both acrylic and solvent free. Made from non toxic, non allergenic methyl cellulose and is also free from fungicides, preservatives and synthetic resins. Earthborn Wallpaper Paste has excellent adhesive properties which are not disadvantaged by its purity. It makes a great job of any wallpaper, including heavily textured and fabric wall coverings.